There was a large number of QCL guests and guides gearing up for an early 5:30 departure this morning, leaving Naden Harbour and heading out into the damp fog of Virago Sound. Except for a light residual NW swell from yesterday, the fishing grounds were fairly flat which made for a nice change of pace from the previous four days of strong northwest winds. The early morning tide change brought on a Chinook snap bite on most of our major fishing points. With larger tides it’s these snap bites most QCL guests are relying on to fill their Chinook quota. Patience, skill and luck all play a factor but with the right combination a few of these black mouthed salmon can be had at each tide. Coho salmon have moved offshore into the deeper water, following large schools of needle fish. If one is willing to search out different depths in 200 plus feet of water…you might be rewarded with a nice supply of Coho chrome in the 7 to 12 lb. range. Some interesting news to hit the QCL VHF radio waves over the past few days is that DFO is searching for a humpback whale which has a fishing net and a buoy attached to it and it may be located in our waters. Out on the halibut grounds today while we were looking for a couple of chickens, we saw a DFO zodiac tracking a humpback whale. I wondered if this was the whale in danger but the boat eventually left and the humpback breached right close to ”One-Fourteen.” Definitely no fishing net on this one and what a show! 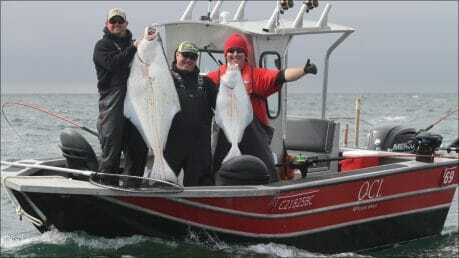 The flat waters made for comfortable bottom fishing and most QCL guests were able to get one of their two Halibut for the trip. 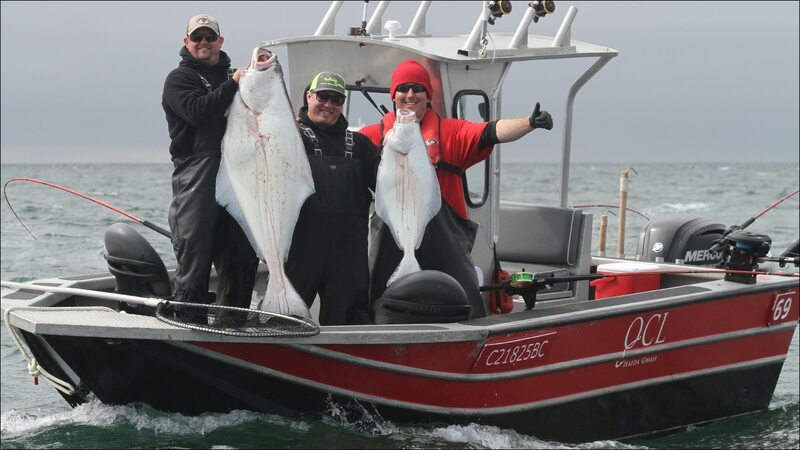 With light winds forecast for the rest of the trip, guests and guides should be able to fish close to the kelp and rock structure in search of that Chinook of a lifetime or a screaming smiley! Till next time… Keep your tip up, line tight, and hang in for the ride!